David Cameron has urged media restraint over a newspaper article revealing that a relative has received treatment for heroin addiction. The Tory leadership contender said he was "very proud" of this person's efforts to kick the drug but hoped they would be "left alone" by the media. Mr Cameron - bookies favourite to land the Tory job - is under pressure to say if he has ever taken drugs. He refused to answer the question on BBC One's Question Time on Thursday. Mr Cameron said politicians were "only human" and everyone was allowed to "err and stray" in the past. He said he was entitled to a private life "before politics", adding the question had nothing to do with the Tory leadership race. He said: "I didn't spend the early years of my life thinking: 'I better not do anything because one day I might be a politician' because I didn't know I was going to be a politician. "And I haven't answered the question about drugs because I think that's all in the past and I don't think you have to answer it." Asked directly if he had ever taken Class A drugs, Mr Cameron said: "I have said all I want to say about this." Mr Cameron has backed the relaxation of drug laws and in 2002 said diamorphine - the medical name for heroin - should be prescribed to addicts "to stabilise them" and help wean them off drugs. On Friday, The London Evening Standard revealed Mr Cameron had been helping a relative who was receiving treatment for heroin addiction. 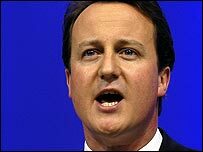 In a statement, Mr Cameron said: "Someone very close in my family has had a dreadful problem with drugs. "They have come through it, been through rehabilitation, and I'm incredibly proud of them. "Their life has nothing to do with my candidature for the leadership of the Conservative Party. Many families will have had a similar experience, and they and I know full well the damage drugs can do. "I hope now that this person can be left alone. I won't comment further on this story." Earlier, one of Mr Cameron's leadership rivals Ken Clarke leapt to his defence saying questions about drugs were just "something to sell newspapers". But Mr Clarke also attacked his younger rival's relative lack of political experience, saying the shadow education secretary has "never actually played any role in national politics". "One speech and a fortnight's publicity and he is up there, with people saying he is now a prime ministerial candidate," Mr Clarke told BBC Radio Nottingham. Tory MPs vote next Tuesday, when the candidate with the fewest votes will drop out. The top two in a second vote, on Thursday, then go to a run-off vote of party members. Mr Cameron remains favourite with the bookmakers to win the contest but David Davis appears to have a big lead among MPs, with 67 publicly backing him, compared to 34 for Mr Cameron. Dr Fox, who like Mr Clarke has confirmed never taking Class A drugs, is believed to have 20 confirmed backers among MPs, with 22 backing Mr Clarke, although as many as 70 remain undecided.